Earlier this month public transit consultant Jarrett Walker ran a post on his blog Human Transit that’s highly relevant to Chicago as we weigh the pros and cons of Mayor Emanuel’s proposal for an express train to O’Hare. In Walker’s article “Keys to Great Airport Transit,” he argues that certain elements are crucial for providing useful and financially sustainable public transportation access. Let’s take a look at how the O’Hare plan, which is currently being brainstormed by the engineering firm Parsons Brinkerhoff, might measure up. Walker starts outs with a cautionary tale for Chicago as we consider the O’Hare express, which officials say would cost between $25 and $35 dollars to ride. Toronto’s Union Pearson airport express has seen disappointing ridership numbers that have continued to drop. Apparently, not many Torontonians are in a rush to take the train to YYZ. Walker argues this is because the fare is too high, at about $20 U.S., and the service doesn’t connect to enough places. He shares the following chart from the recent Pearson Connects study, a transportation plan for Pearson Airport by Urban Strategies, Inc. It suggests that airports that are connected to a city’s whole rapid transit network, not just a route to downtown, have a higher air passenger transit mode share. By that measure, O’Hare already has pretty good rail access. The Blue Line offers a direct connection to many different parts of town, and it’s easy to transfer to most of the other ‘L’ lines once you reach the Loop. It’s also an affordable, efficient way to get to work for hundreds of airport workers. “To create a great airport train (or bus) for air travelers, you have to make it useful to airport employees too,” Walker writes. “That generally means a service that’s an integral part of the regional transit network, not a specialized airport train.” The Blue Line fits that bill. Walker notes that it’s highly desirable to have rail service that doesn’t just terminate at the airport, like the Blue Line does. He cites Sydney and Seattle as best practices, and Washington, D.C.’s Metro service to Reagan National Airport also springs to mind: You can keep traveling beyond the airport to outer suburbs. Right now, you can also access O’Hare via Metra’s North Central Service by getting off at the O’Hare Transfer station on the northeast side of the airport, catching a shuttle bus, and then the airport’s people mover to the terminals. While this method is a bit convoluted, it serves as a transit route to the airport for people who live north of O’Hare along the North Central line, as far as Antioch, Illinois, near the Wisconsin border. A map of the route for the CrossRail proposal. Using the North Central right-of-way for the O’Hare express is a likely scenario, although a direct rail connection to the airport would be necessary to make the service appealing to business travelers. If a tunnel is built to provide that connection, it would add value to the project if Metra trains are also able to access the terminal, providing folks who live north of O’Hare with a direct route to the airport. Moreover, if the O’Hare express is done as part of the Midwest High Speed Rail Association’s CrossRail proposal to connect the North Central Service with the Metra Electric District Line on the Southeast Side, the project could have even more utility. Walker points out that, even if an express train has a shorter “in-vehicle time” than one that stops more often, there is often little overall time savings if the frequency of service is lower on the express. As local urban planner Daniel K. Hertz noted in a recent Chicago Magazine piece, while the Blue Line runs every four minutes during rush hour, the O’Hare express will likely have 15-minute headways, which would nullify much of the timesaving advantage. And, since the express would likely terminate in the West Loop, farther from Michigan Avenue hotels than the Blue Line stops on Dearborn Street, the need to take an additional taxi or bus trip would further reduce the appeal of the express train. Chicago aviation chief Ginger Evans has argued that lawyers and bankers traveling to and from O’Hare want a quiet place where they can talk on the phone or pull out a laptop. If that’s the case, perhaps there would be a market for first-class cars on the Blue Line. Since a nonstop train wouldn’t get travelers to their hotels much faster anyway, a nicer car attached to the end of the Blue Line wouldn’t necessarily be a downgrade from pricey express service. Hopefully the city will consider some of these ideas as alternatives to simply building an expensive train that only travels between the airport and the Loop, increasing the project’s chances for success. Precisely because the CrossRail design calls for the O’Hare service to continue on the St Charles Air Line thence to MED, it meets the criteria for connectivity and usage for other than airport only travel. Adding a faster commute from the South Lakefront area to O’Hare via the West Loop also opens new routings for many other trips. 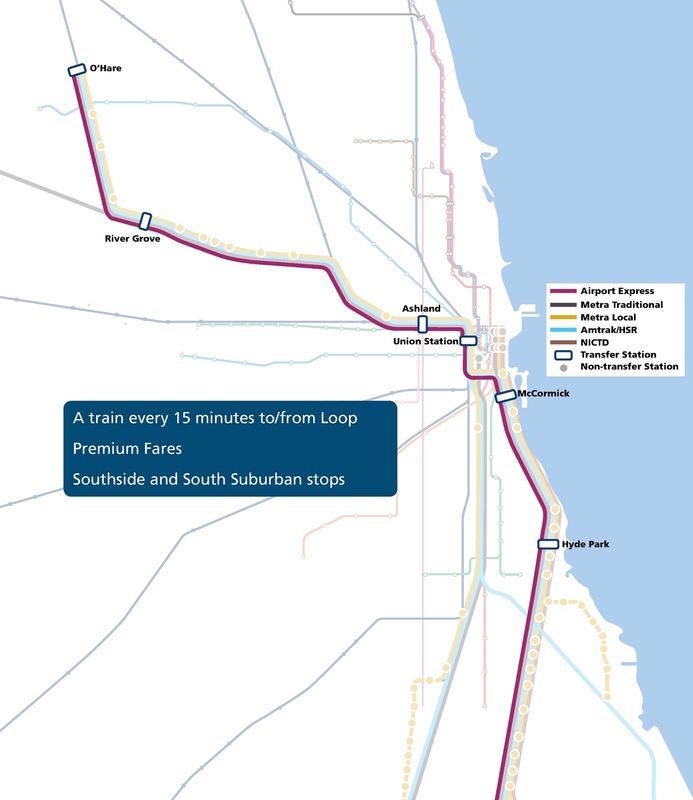 Chicago has many good rail transit lines,but could use a number of both connections and extensions to make the system exponentially better. My parents in McHenry County often take Metra to Jeff Park to O’Hare. The savings are significant vs car service or parking. One interesting note from the table provided is how many cities integrate their national rail network with their airports. Having O’Hare as a secondary hub to Union Station would significantly improve the value of Amtrak. I can’t see how a new train line to O’hare will be anything other than a huge failure. We have 2 train lines to O’Hare (metra and El), both very affordable. If we build a high speed option to cut 15 minutes from the trip, door-to-door travel time will be about the same for 90% of people anyway (since the Blue Line with many stops will be closer to the destination with higher frequency). Add to this the high price of tickets on the high speed line, you are asking people to pay an extra $30 to save most likely 5 minutes or less, unless their destination is close to Ogilvy / Union station? If there was no transit to O’hare, this could make sense. But marginal cost in dollars and minutes is all most commuters will care about. First, I do NOT support a $30 fare for an O’Hare express: Ihave longcalled for all Metra Service within CTA served areas top honor all CTA fares. Second, I point out that if connected to MED via the St Charles Air Line, users headed for the McCormick Place area get a faster and less congested ride. Third, increasing service on Metra to the West Loop from both ends offers better transit options for everyone along the routes. I’m not opposed to Crossrail as a short-term fix, but a design that misses the Loop is not exactly preferrable either. Forgetting about the business elite stakeholders for a second, the fundamental issue that through-running must solve is that the destination-rich MED itself is not well connected to the Loop, and not to the O’Hare-serving Blue Line or NCS or any other line. IMO this is the point-of-view upon which the discussion must be framed, and not on creating a third redundancy to ORD (that already has a Loop-direct service). Fixing this connectivity in terms of an extension from Randolph St. to a cross-platform Clark/Lake transfer would provide the largest benefit in terms of connectivity for a similar cost range, rather than overhauling/building a 15-20 mile line. along the Green Line? There’s your one-seat service between O’Hare and the south side, using almost entirely existing infrastructure – you’d just need to lay some track at Block 37 and possibly a place for trains to switch tracks to head back north after the Cermak station. Exactly, & if some business people want to board at Union Station for that “Express” service, it’s an added bonus. But don’t sell rail improvements as a luxury service, sell them as an amenity for anyone traveling on any Midwest Amtrak route. Thanks for this article. It broadens the context for what actually might improve transit service to O’Hare. Many Comments also clarify and raise sound issues. However, two key issues need solutions if anything effective is to be done for O’Hare’s transit… or anywhere else in Chicagoland. First, transportation’s governance needs an overhaul. Rahm is exploring a private partnership because current public assets are undisciplined in their public service. Metra is unresponsive and the Mayor is tired of fighting with the CTA’s union over small stuff. While the CTA is supposed to be under Chicago’s control, it is not. CTA mismanagement of the O’Hare station is so legendary (and embarrassing) that there is no need to recount the sad history now. Metra, as we know from bad blood apparently not vetted, is intentionally structured so Chicago service is secondary and O’Hare tertiary. Based on poor performance and a general inability to serve the public, current agencies are unlikely to solve O’Hare’s transit problems. Second, public money will need to be spent on O’Hare… lots more than anyone is telling us. Any funds should be contingent on current agencies changing how they do business. The Crossrail proposal makes sense. However, it should be accompanied by a proposal to fund other key transit needs that includes changing the agencies now failing us. Sydney is not a model for other cities. There are plans for improvement but so far no political will to make it happen. Meanwhile the now privately run airport makes a large profit (partly because it gets the so called ‘departure tax’ and pays no tax.itself. Denver wants 9 bucks to dia. It’s insanity.